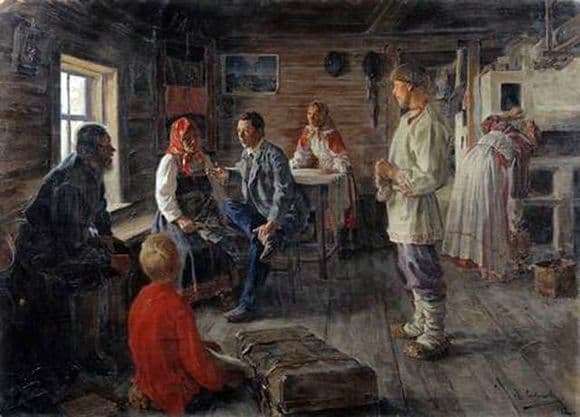 The painting “At Home” was created in 1902. This work has a deep meaning and is unlikely to leave anyone indifferent. Very accurately and realistically conveyed the artist of the peasants of the time, their originality. Uncomplicated household utensils, shops along the walls and, of course, a Russian stove. The modest dwelling where country people live, not burdened with the big income. The usual wooden hut, with nailed nails for hats. Apparently the young man returned home from a big city. Perhaps after school, because his clothes are more like the official form. All the relatives surrounded the visitor and listened to his story with curiosity. Here sits an old grandfather with a beard, and a grandmother. Probably, the arrival of a man is a significant event and everyone listens to him with interest. Another young guy is standing, holding a hat in his hands. He seems to be in a hurry on business but he really wants to listen to the guest. The little boy turned his back, his gaze does not look away from the visitor. Children are always curious about what is going on outside their world, and the world is a small deaf village. The old man leaned back a little, by himself, showing that he does not believe in the story, because the interlocutor is talking about something absolutely unbelievable. One woman stokes the stove, she is also interested to listen to the guest, but the heat in the house is very important. Apparently it was already cold outside, because the grandfather had felt boots on his feet. The visitor to each other tells about his impressions and it is clear from his face that he is no longer the same country boy he left home. It is impossible not to notice the contrast in the clothes of the characters. Woven bast shoes significantly lag behind modern visitor leather shoes. Perhaps the appearance of the guest is so surprising to others, but their attention is hard not to notice. We immediately see that it is different, not like the locals. The picture today has not lost its relevance. Many young people leave their villages to study or work. Arriving at home, they also stand out and in their image they no longer recognize the guy from the neighboring house, although no one wears bast shoes or valenki for a long time.